As this year approaches its end, I realize it’s given us much to think about. We’ll soon get swept up in planning for the holidays, so now seems like an appropriate time to take stock of where we’ve been and to share updates from my own life. My home state faced a shooting after a madman massacred nine at a Charleston church. A historic flood claimed 19 lives and ravaged homes and businesses across the state. The community has joined to support people affected by these events. It’s been an amazing year. I’ve never been more proud to be a South Carolinian. 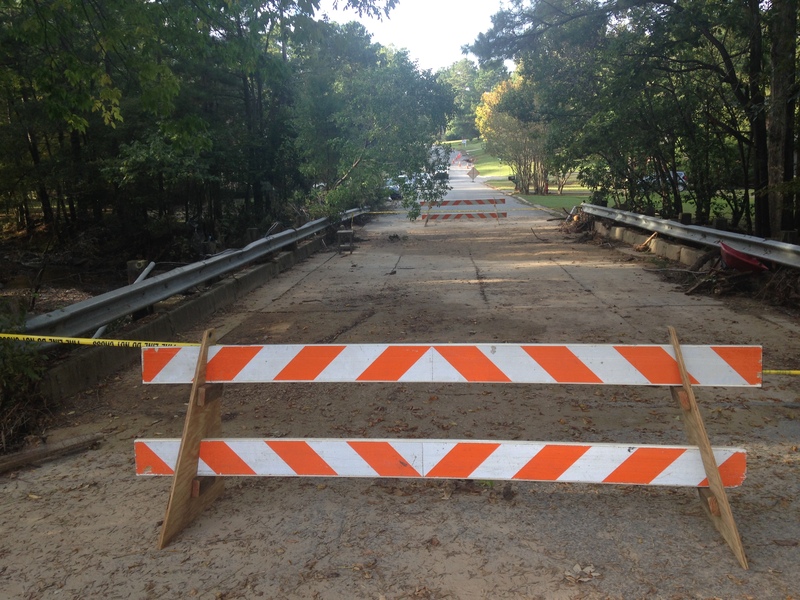 A Columbia neighborhood bridge closes after Rawls Creek floods on October 4. My own life has been full of busyness. I was invited this fall to join forces with the talented group over at The Design Consortium. The group provides comprehensive web design and management. I offer copywriting and I assess websites for user-friendliness through TDC. Come on by for a visit and let me know how I can help you with your organization’s goals. This year has brought us a lot of change, and with it joy and growing pains. But I like what Ben Franklin had to say about change—“When you’re finished changing, you’re finished. I guess I’m not finished.